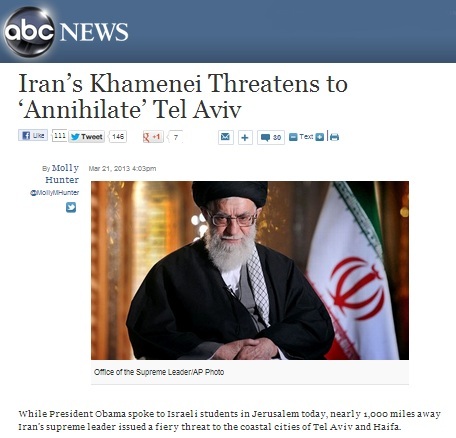 On Thursday, March 21, 2013, ABC News ran an alarming headline: "Iran's Khamenei Threatens to 'Annihilate' Tel Aviv." "At times the officials of the Zionist regime (Israel) threaten to launch a military invasion," said Ayatollah Ali Khamenei in a televised speech marking the Persian New Year, Nowruz. "But they themselves know that if they make the slightest mistake the Islamic Republic will annihilate Tel Aviv and Haifa to the ground," he said. Other news outlets were a bit more forthcoming in their banners about the nature of Khamenei's comments, made during his annual Nowruz address in the city of Mashhad. Reuters' report on the speech proliferated quickly; its headline, "Iran will destroy Israeli cities if attacked: Khamenei," alternative renderings such as "Iran threatens to destroy Tel Aviv, Haifa if Israel attacks," can be found everywhere from NBC News to Fox News to the Jerusalem Post. By contrast, the wire service UPI and a right-wing Israeli settler outlet followed the ABC lead by dropping the conditional clause from their headlines. While issuing such a declaration is certainly forceful and brash, let alone exaggerated, it is clearly made as a deterrent rather than an aggressive and unprovoked threat. Indeed, Iran has long stated that it will never initiate a military conflict and maintains a national security doctrine of self-defense and retaliation, policies consistently affirmed by U.S. intelligence assessments. But such headlines, when deliberately devoid of context, send a strong message of Iranian bellicosity and increase the erroneous perception that Iran is threatening Israel with attack, instead of the other way around. They are merely an extension of the "wipe Israel off the map" shibboleth that, even after more than seven years, remains ubiquitous in mainstream discourse despite its repeated debunking. In fact, declarations like this are nothing new. For instance, back in June 2008, after Israel conducted a series of war games and then Israeli Deputy Prime Minister Shaul Mofaz told the press, "If Iran continues its program to develop nuclear weapons, we will attack it," Iranian officials replied much as Khamenei has to more recent threats. At the time, IRGC commander Mohammad Ali Jafari stated, "If the enemy makes a strategic mistake [by attacking Iran], the Revolutionary Guards are fully prepared to give a severe answer to the enemy." In February 2010, Iranian Deputy Foreign Minister Ali Ahani said in an interview, "Iran certainly will not start a war. But if we are attacked, we will respond strongly." In August 2011, Iranian President Ahmadinejad responded to the possibility of an American or Israeli strike by stating that "we will defend ourselves within our capabilities" and that, in the event of such an attack, Iran would "give them a decisive response." Later that year, in an address to military cadets, Khamenei said that Iran would "respond to any aggression and even to any threats powerfully" with "strong slaps and iron fists." Khamenei also warned last June that, were Israel to "take any wrong step, any inappropriate move, it will fall on their heads like lightning." At the same time, Iran's Brigadier General Yahya Rahim-Safavi stated that Iran would respond in kind were Israel or the United States launch an attack. "There is no spot in Israel that does not fall within the range of the Iranian missiles," he said, adding that U.S. military bases in the region would also be potential targets. Because "U.S. military forces in the region are highly vulnerable," he said, Iran is in a position to "inflict damage on them at the same level as they do." Echoing these statements, in September 2012, General Jafari said that "nothing will remain of Israel," should it attack Iran. "Given Israel's small land area and its vulnerability to a massive volume of Iran's missiles, I don't think any spot in Israel will remain safe," he claimed, noting also that "U.S. military bases sprawled around Iran are considered a big vulnerability." Following more threats by Israel last autumn, notably Netanyahu's embarrassing cartoon bomb display at the United Nations, the Iranian mission to the world body issued a statement insisting, "The Islamic Republic of Iran is strong enough to defend itself and reserves its full right to retaliate with full force against any attack." Meanwhile, the Iranian press quoted General Farzad Esmaili, head of Iran’s air and ballistic missile units, saying, "If a military attack is launched against our nuclear installations, we promise that the enemies will not escape alive." Soon thereafter, Ahmadinejad said, "Iranians have and will never start any war but they have always been good defenders and have always defended their territories in a memorable and historical form," adding that "Iran's response to any aggression will be crushing." A week before Khamenei's own Nowruz speech this year, Iran's Deputy Chief of Staff Brigadier General Masoud Jazayeri declared, "Our commanders have received authorization to immediately respond to any hostile action by the enemy." He added, "We too have all our options on the table." This is not news, nor is it particularly alarming. In fact, it is unsurprising that a sovereign nation, when faced with the repeated threat of attack by two of the world's most aggressive nuclear powers, would voice its intention to respond in kind were an assault on its 70 million people to occur. Spinning statements of self-defense and retaliation to foreign military aggression as threats themselves is par for the course when it comes to Iran and the media. Just last month, when President Ahmadinejad explicitly denied any Iranian intention to launch an attack on Israel, noting Iran's potential "reaction to such a strike, as well as Iran's defensive capabilities," UPI ran a story with the headline, "Ahmadinejad - Iran ready to destroy Israel." Perhaps this is to be expected, though, from a so-called "journalistic" organization that consistently publishes MEK propaganda and bizarre anti-Iranian rants. Most importantly, however, by distorting Khamenei's recent comments, the mainstream media wound up demonstrating their own fealty to sensational alarmism while either overlooking or burying the more illuminating content of the speech itself. Of all places, Radio Free Europe/Radio Liberty, the U.S. government's Cold War propaganda arm and overseas version of Voice of America, avoided much of the decontextualized hysteria found in other reports. Journalist Golnaz Esfandiari, while mentioning Khamenei's warning about Tel Aviv and Haifa in the sixteenth paragraph of her article, led instead with the news that the Iranian leader noted in his speech that "he's not opposed to direct talks with Washington." Coming in advance of more rounds of negotiations with the P5+1 - the five nuclear-armed permanent members of the U.N. Security Council and Germany - Khamenei's comments regarding potential bilateral talks with the United States were well in line with what he has said on the subject in the past. I am not optimistic about such negotiations. Why? Because our past experiences show that in the logic of the American gentlemen, negotiation does not mean sitting down together to try to reach a rational solution. This is not what they mean by negotiation. What they mean is that we should sit down together and talk so that Iran accepts their views. The goal has been announced in advance: Iran must accept their view. For this reason, we have always announced that this is not negotiation. This is imposition and Iran will not give in to imposition. I am not optimistic about these statements, but I am not opposed either. We know in negotiations that you will not get everything before the start of the negotiations. In fact, that insistence to get everything before you start negotiating, the result of that was six years of wasted time on resolving the Iranian issue. We wasted six years in the past because the Western approach was that Iran should give everything before the start of the negotiation. In his recent Nowruz address, Khamenei was clear about how to resolve the three decade impasse between the United States and Iran. "If the Americans sincerely want to reach a solution, I will give them the solution," he said. "The solution is that the Americans should stop being hostile towards the Islamic Republic and the Iranian nation. Offers of negotiation are not a rational and reasonable solution...[T]he rational solution is that they should rectify their policies. They should rectify the way they act and they should stop being hostile towards the Iranian nation." Of course, such a change in U.S. policy - the cessation of threats and the normalization of relations - is a far greater threat to Israeli hegemony than any hypothetical counterattack. April 18, 2013 - Speaking to reporters on the sidelines of a military ceremony, Iran's Defense Minister Brigadier General Ahmad Vahidi repeated the Iranian position that any Israeli attack would be met with a devastating military response, while also dismissing the possibility of such an attack as mere bluster. "The constant threats by the Zionist regime against Iran are so worthless and they cannot do anything against our nation because they know that any measure will lead them to full annihilation," Vahidi said, adding, "We don't think that the Zionist regime will take such an unwise action to commit suicide." Vahidi's comments came on the heels of recent statements by both IDF chief Benny Gantz and Israeli Defense Minister Moshe Ya'alon, along with Prime Minister Netanyahu, claiming that Israel was prepared to strike Iran if the decision was made to do so. Iran has routinely dismissed such threats as nothing more than bellicose posturing. April 24, 2013 - In yet more comments on the same subject, Iran's Defense Minister Ahmad Vahidi said today that American and Israeli "threats have no value and at the same time, show their aggressive nature, and reveal their deceitful and misleading claims," adding that any Israeli strike on Iran would be the regime's "last mistake." Vahidi's latest statement follows U.S. Secretary of State Chuck Hagel's recent visit to Israel, during which he cemented a massive arms deal that he said should send a "very clear signal" to Iran. This past weekend, Hagel claimed that the United States and Israel see "exactly the same" threat from Iran and followed up such rhetoric the next day alongside his Israeli counterpart Moshe Ya'alon by declaring, "All military options and every option must remain on the table in dealing with Iran." Despite the admission of U.S. Director of National Intelligence that sanctions on Iran have not affected nuclear policy shifts in Iran (which include the continuing, non-militarized civilian nature of its nuclear program), Hagel insisted, "The sanctions on Iran are as potent and deep and wide a set of international sanctions that we have ever seen on any country. And those will continue to increase." As for the potency of sanctions, Hagel is praising the negative impact such collective punishment is having on lives and livelihoods of the people of Iran, while promising more. "Whether it leads to an outcome that we desire remains to be seen...and as I said, the military option is always an option," Hagel reiterated. But remember, we're still supposed to believe Iranian officials are the ones issuing bellicose threats apropos of nothing. With this in mind, take note of statements made by Israeli President Shimon Peres during a joint media event with Hagel on April 22. In the context of alleging, as he often does, that Iran is somehow a "threat to Israel, Peres stated, "By the way, you know [we] have nothing against the Iranian people...Iran doesn't have a single enemy. Nobody threatened Iran. Why did their leaders decide to become a threat to others?" Wait, what? "Nobody threatened Iran?" In the time that remains, we must urge the other nations of the world to act, and tell them that it is time to stand behind the promise that was made to us, to fulfill their responsibility, whether that means serious sanctions or whether it means a military operation. In fact, no intelligence agencies claim that Iran is close to having a nuclear weapon as the international consensus (including that of Israel itself) has long been that Iran has no nuclear weapons program. Threatening an unprovoked attack on Iran is unquestionably a violation of the United Nations Charter. In his recent comments with Chuck Hagel, Peres trod this same ground. "Israelis understand that Iran is not just a threat to Israel," he whined, "It's really a threat to the peace in the world, for no reason whatsoever. The world doesn't threaten Iran." Actually, Peres is correct about one thing. "The world" - namely the 120 nations of the Non-Aligned Movement in addition to China, Russia and many others - "doesn't threaten Iran." But the countries that both Peres himself and his guest Chuck Hagel represent certainly do. April 26, 2013 - Iranian Deputy Defense Minister Majid Bokaei has echoed the sentiments of his boss, Defense Minister Ahmad Vahidi, according to a report from PressTV. Brigadier General Majid Bokaei called recent threats made by American and Israeli officials "psychological warfare" and "ranting," and said, "If enemies make a mistake we will answer their threats in the battlefield." He similarly dismissed the potential of any Israeli attack on Iran, citing "major economic, political and geopolitical problems" facing Israel. January 24, 2014 - In response to recent comments by U.S. Secretary of State John Kerry regarding a potential military strike on Iran, Brigadier General Seyyed Massoud Jazayeri - Iran's deputy chief of staff - said in an interview that, in the event of an attack, American interests in the region would be "completely destroyed." Speaking to Al Arabiya this week, Kerry defended the interim international deal over Iran's nuclear program and the alleviating of some sanctions, but declared that if Iran were to back out of its commitments, "the military option of the United States is ready and prepared to do what it would have to do." Such rhetoric is par for the course for American officials focused on diplomacy, but still eager to appear bellicose and aggressive to certain influential communities and audiences. Last month, in a conversation at the Brookings Institution's Saban Center, a pro-Israel think tank in Washington, DC, President Barack Obama said much of the same. "What I've consistently said is even as I don't take any options off the table," Obama told Haim Saban, the organization's Israel-obsessed billionaire benefactor, "what we do have to test is the possibility that we can resolve this issue diplomatically." The president repeated this a number of times during the conversation. "The best way for us to prevent Iran from getting a nuclear weapons is for a comprehensive, verifiable, diplomatic resolution, without taking any other options off the table if we fail to achieve that," he said, adding later that "when the President of the United States says that he doesn't take any options off the table, that should be taken seriously." Following Obama's own appearance, Secretary Kerry also addressed the Saban conference in December. He assured the attendees that "as we negotiate, we will continue to be perfectly clear that, for Iran, the price of noncompliance, of failing to satisfy international concerns about the nuclear program, will be that we immediately ratchet up new sanctions, along with whatever further steps are needed to prevent Iran from acquiring a nuclear weapon, including – as President Obama just made clear – a military option, if that were necessary." In his own recent comments, General Jazayeri emphasized that the U.S. government is well aware that "the military option against Iran is not practical." Hossein Naqavi Hosseini, spokesman for the National Security and Foreign Policy Committee of Iran's Majlis, reacted to Kerry's new comments by saying, "These statements are indicative of the U.S. double standards and will bring about nothing but tarnishing the US image," adding, "Definitely, we also announce that if the P5+1 (five permanent members of the UN Security Council plus Germany) commit the least breach of the Geneva agreement, we will also have all the options on our table." "Under pressures by the Zionist lobby, the U.S. adopts dual policies; on the one hand, they talk about agreement and positive relations with Iran, but on the other hand, they use an intimidating tone," Hosseini said. We have a high degree of confidence that when they look at 35,000 U.S. military personnel in the region that are engaged in constant training exercises under the direction of a president who already has shown himself willing to take military action in the past, that they should take my statements seriously. And the American people should as well, and the Israelis should as well, and the Saudis should as well. Obama added that he would prefer to "resolve this issue diplomatically," considering that "[t]here are always consequences to military action that are unpredictable and can spin out of control, and even if perfectly executed carry great costs." In response, Iranian Brigadier General Massoud Jazayeri, deputy chief of staff of the Armed Forces for Cultural Affairs and Defense Publicity, dismissed Obama's statement as "the joke of the year." "The low-IQ U.S. president and his country's Secretary of State John Kerry speak of the effectiveness of 'the US options on the table' on Iran while this phrase is mocked at and has become a joke among the Iranian nation, specially the children," Jazayeri said, according to the government-run Fars News Agency. "Obama's statements about the number of the U.S. troops in the region and the extent of their influence are completely inexpert remarks far from the reality," he declared, "and these statements can be used as the joke of the year." He also warned that, were Iran to be attacked by American forces, Iranian retaliation would be devastating, saying, "If they err, the region will be turned into a hell for them." Jazayeri also suggested that the American people be more skeptical of official statements made by their politicians regarding Iran, noting that "if they contemplate a little, they will come to realize how false many of their words are." Also responding to Obama's remarks, Iranian Foreign Ministry Spokeswoman Marziyeh Afkham chided the American president for falling back on tired talking points and bellicose rhetoric. "One part of the remarks made by the U.S. president is in contradiction to the principles of international law and against the spirit of diplomatic negotiations meant to prevent unconstructive slogans and resorting to threats," she said.